The 15-mm Endocatch bag is deployed over the kidney toward the splenic fossa. 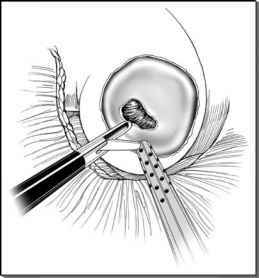 The surgeon gently places the allograft onto its anterior surface and moves the bag behind the graft. The kidney is then gently placed into the bag, making sure that the ureteral stump is entrapped as well (Fig. 9). The bag must be kept in view during this maneuver, taking great care not to injure the bowel or other intraperitoneal structures. The advantages of "prebagging" the kidney prior to hilar vessel transection include rapid delivery with minimal warm ischemia time and providing traction to help obtain maximum vessel length. ■ The main potential disadvantage of this technique is the possibility of arterial vasospasm. This should not occur if minimal traction is placed on the renal hilum during the extraction process.